The SCOTT Sub Tour eRide 20 Men provides outstanding value, a plethora of great features, and delivers superb performance. Simply put, this ebike offers real value for money and outshines many of the competition. Based on 700c wheels, the Sub Tour eRide 20 Men is full of great features and high level components. It’s extremely comfortable, provides ultra-tuned ergonomics, and is an easy to ride touring e-bike. It’s equally at ease on tarmac roads or loose terrain. The strong Bosch Active Plus motor and large semi-integrated 400Wh battery make cycling a real breeze, and provide great range for leisurely rides out. A brand new frame design for 2019 is the most outstanding feature, and doesn’t she look fabulous! The Sub Tour eRide 20 Men is sensible and straightforward in design. It’s front forks are strong yet versatile. They cope easily with everyday bumps to ensure a smooth and even ride. The Shimano Alivio 4000 9-speed gearing works extremely well and suits the bike down to the ground. Hydraulic disc brakes also from Shimano ensure responsive and effective braking when required. The wheels on the eRide 20 Men offer longevity, strength and stability. Each wheel comprises a quality Shimano hub and black anodised Mach 1 rims for real strength and resilience. The whole package is first class, and provides a reliable and strong wheel. Add to that a 50c Schwalbe Energizer Plus tyre with puncture resistance and you have a really nice, confident and comfortable ride ahead. Strong lighting features on the SCOTT. Both front and rear lamps are via Spanninga, and ensure good rider visibility. Robust mudguards, front and rear ensure a clean ride every time. Furthermore, a very useful Racktime™ rear carrier allows luggage to be easily attached and removed. Hassle-free! 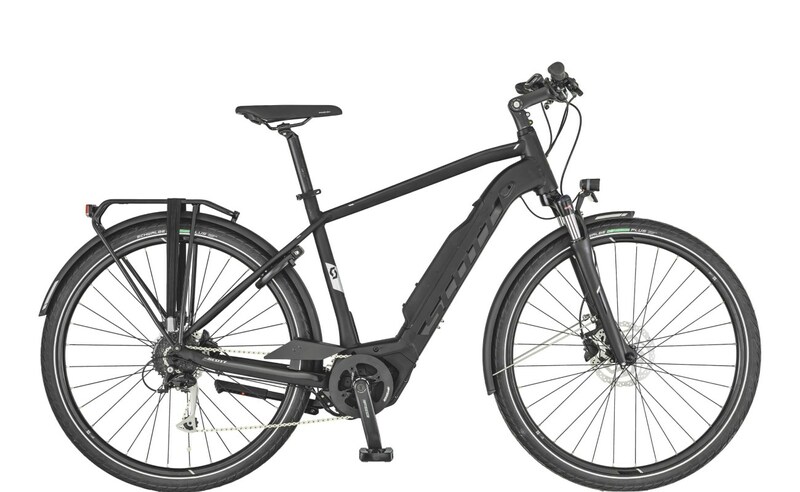 The Sub Tour eRide 20 Men from SCOTT is a cost effective, general purpose ebike with lots to offer!